Having sufficient knowledge and understanding of how floor-laying craftsmen carried out their work years ago is definitely beneficial to anyone attempting to repair a parquet floor, and our guys have all been taught the basics of how it was originally done. Fortunately the ancient skills have not all been lost through the mists of time, and have been passed on by Craftsmen over the years who often took on apprentices. These lads were pleased to work for little more than their food and lodging. Apprentices would save the small amount of money they earned for special trade-tools which they would then keep for most of their working life. Sometimes, their parents would actually pay for the training, because if the child eventually became a skilled craftsman he would have a trade that would last him his lifetime and he may eventually also be able to help to feed the entire family. The Romans discovered that roads became more stable when their oblong bricks were pointed in the same direction as the traffic. The basic herringbone pattern also became a popular choice for domestic floors made from wooden blocks right up to the Middle-Ages and eventually this type of floor was regularly installed throughout Europe from the 16th century onwards. An early example of Herringbone Parquet can be seen in the Gallery at Chateau de Fontainebleau in France which was home to King Francois 1st who was a rival to Henry 8th of England. The Italian craftsmen who laid it for him in 1539 were in great demand afterwards, as this design developed into the most fashionable style of the times. Solid wood parquet was introduced to the UK during the 17th century by Queen Henrietta Maria; the youngest daughter of King Henry IV of France, who became wife of Charles I. Being a keen supporter of the latest fashion in her native country, she invited Inigo Jones and other architects to redesign and renovate part of Somerset House Palace in 1625. 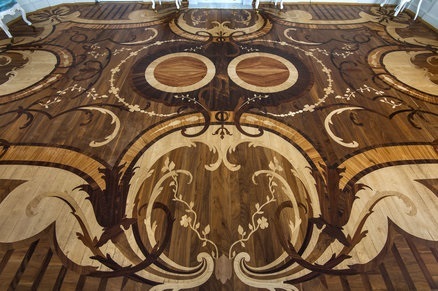 One of the first projects was the inclusion of parquet flooring which was then known as"Parquetry". The palace was renamed in honour of Anne of Denmark, wife of James I of England (James VI of Scotland) when they moved to Somerset House in 1603 and it was known as Denmark House during the renovation. This type of flooring brought a touch of the French Court to the home of Henrietta, and the idea quickly spread throughout the British aristocracy. 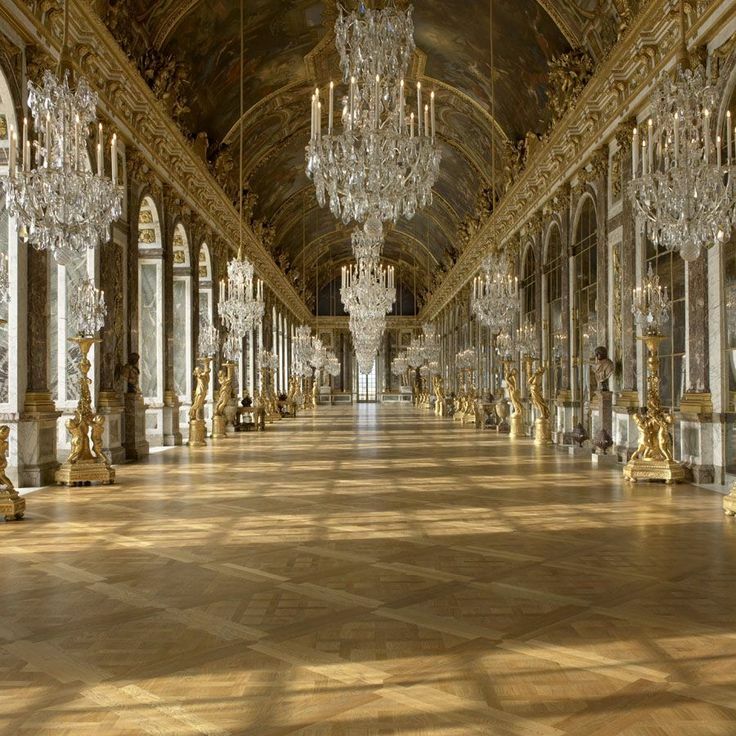 Parquetry became a statement of opulence and eventually evolved into a major symbol of affluence among the wealthy. Original examples of 17th century parquet fitted by master craftsmen in the UK can still be seen in the finest stately homes that have escaped alteration such as Boughton House in Northamptonshire sometimes referred to as "The English Versailles", and the "Great Hall" at Ham House in Richmond Upon Thames. 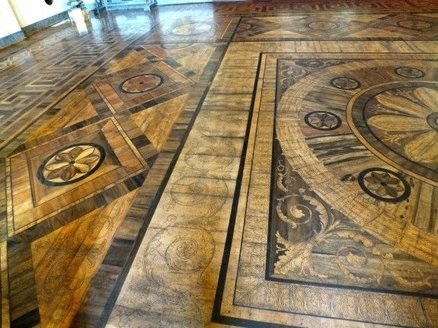 The trends for parquetry continued well into the 18th century with patterns gradually becoming more ambitious and elaborate; in fact some of these 17th Century Parquet Patterns. and fitting practices are still used by craftsmen today. Unfortunately, some of the original examples lost through decay, demolition or fire, have often been replaced with new designs and materials during restoration. Timber Planing machines were introduced in the 1790s, but consistency in production was not achieved until the advent of steam-powered mechanical saws during the 1830s. Mass-produced tongue-and-grooved floorboards then became a possibility, and this simple system is still widely used in the building trade to the present day. 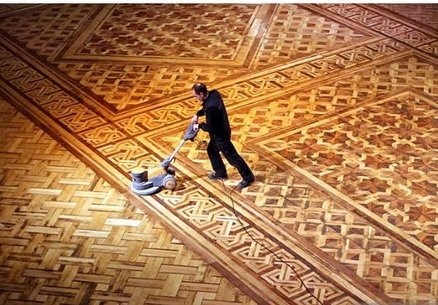 This mechanical method also enabled parquet to be manufactured in different sized oblong shaped blocks of wood that fitted together to produce intricate geometric designs. Throughout the 20th century, many beautiful Parquet floors were pulled up casually and carelessly to make way for central heating systems. During the 1940s and 1950s the wooden Parquet floor was taken up in many homes to allow the installation of asbestos lagging around under-floor pipe work. This practice was mainly phased out in the 1960s however, and thorough surveys to identify asbestos since then have led to even more destruction, with floors being completely disposed of to remove the dangerous material. Herringbone with a tongue and groove fit was the most popular Parquet design during the Victorian era, and although extremely expensive, it remained so right up to the mid 1930s. It was usually laid in the most prominent area of the home near the entrance on the ground floor of the house such as a hallway or reception space, and these floors are the most frequent type we are asked to renovate in Leicestershire. Historical wooden parquet floors, especially the ones that have preserved their original look, demonstrate true evidence of floor laying skills of those craftsmen. 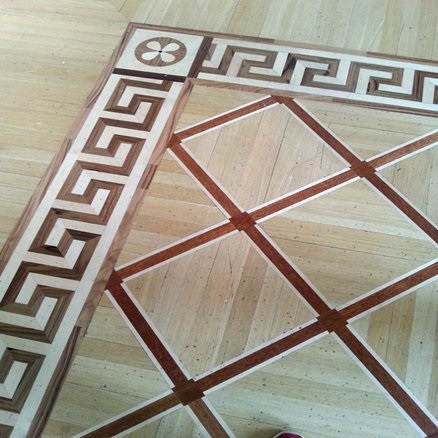 We find through carrying out Parquet restoration that the floor we are working on always reflects their artistic perception and our guys always appreciate their work considering the lack of technology available when these wonderful floors were originally created.